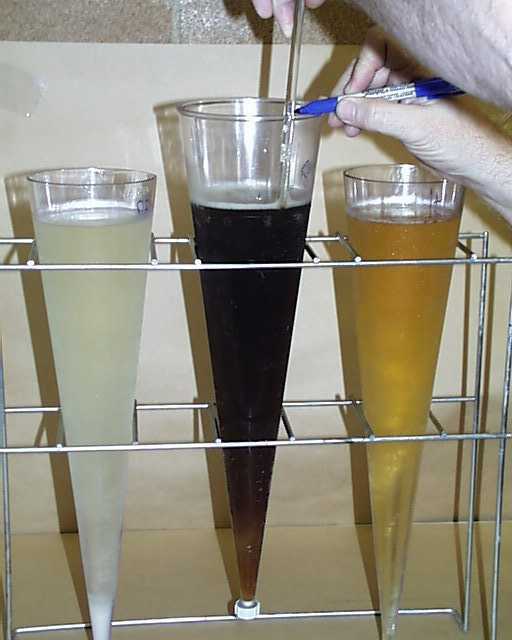 Three liquid deicers after 7 days in the freezer. 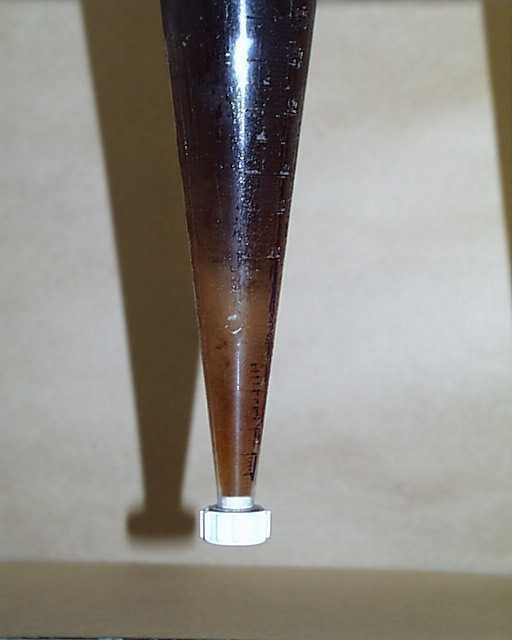 Closeup of settleable solids at the bottom of the cone. 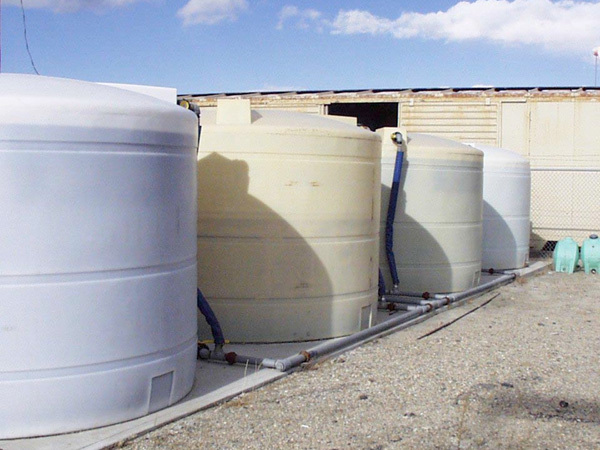 Marking the displacement due to the settled solids. 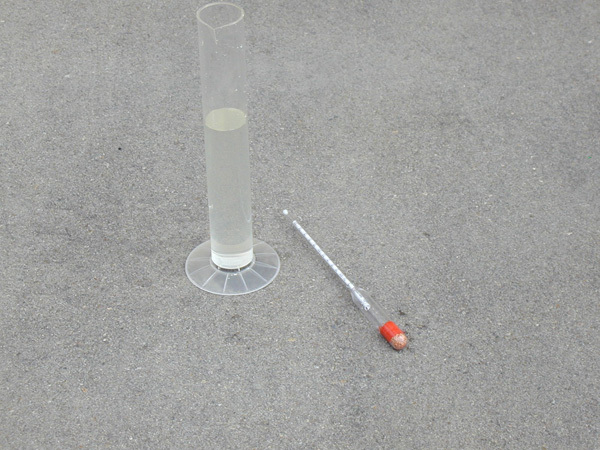 Measuring the displacement volume based on the marked rod. 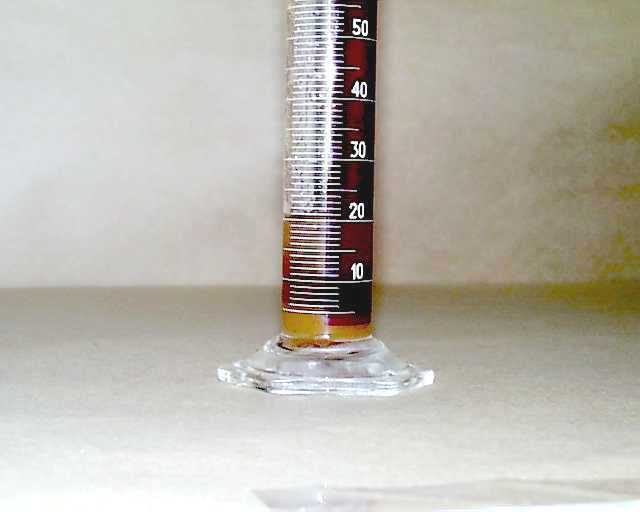 Volumes that exeed 10 ml fail the test. Pouring the deicer through a No. 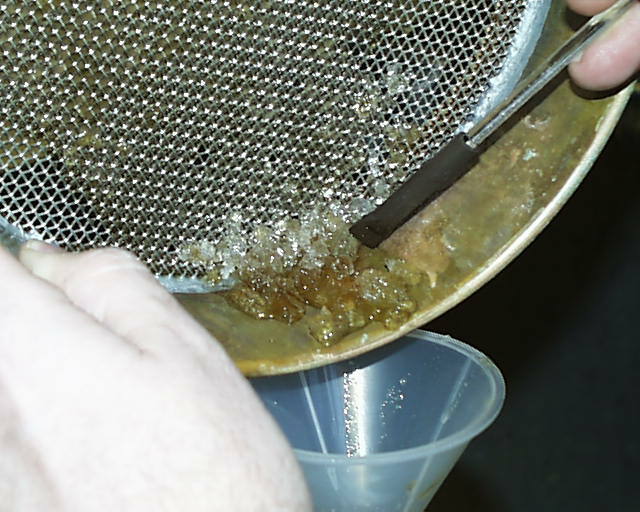 10 sieve to capture large solids. 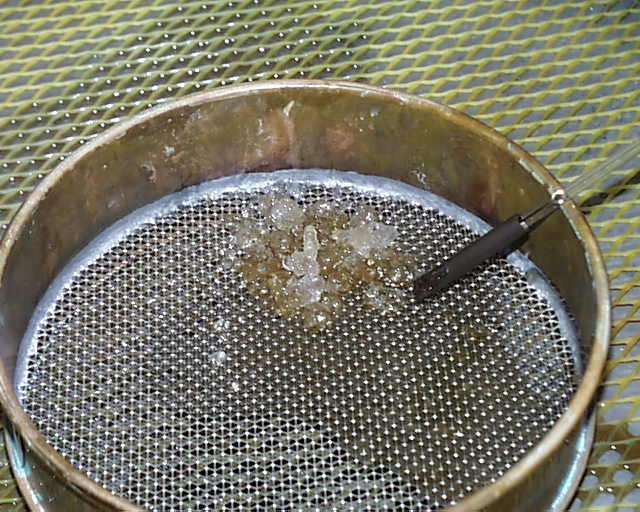 Settled ice crystals or frozen chemical shown on top of the sieve. 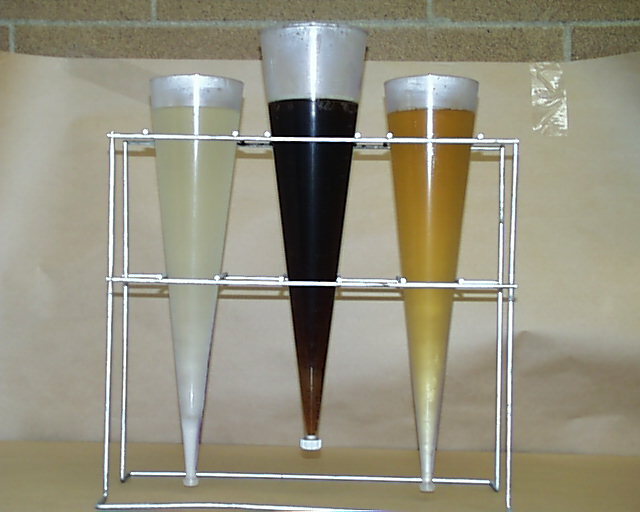 Transferring the solids through a funnel to a graduate cylinder. 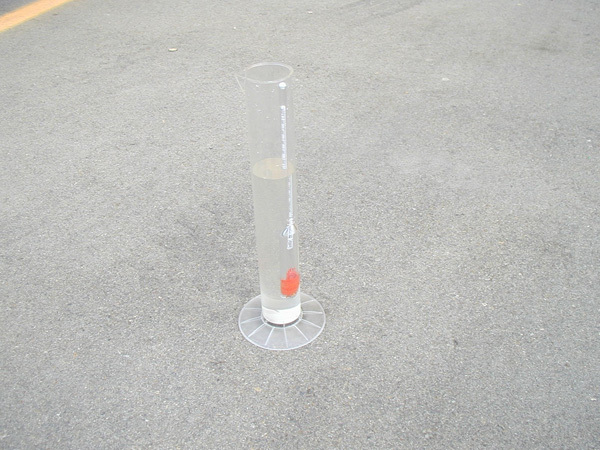 Measuring the volume of the settleable solids in a graduated cylinder. 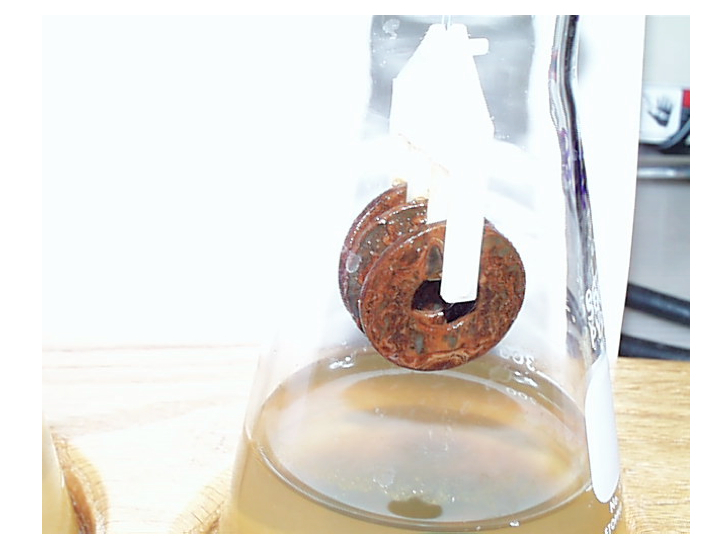 Solutions/Solids that exceed 10 ml fail the test. 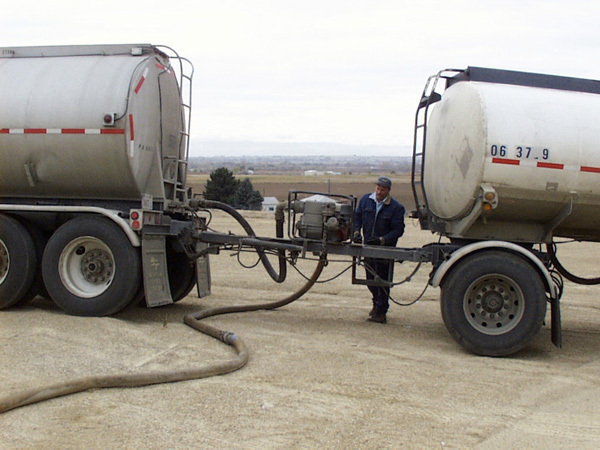 Off loading a liquid deicer from a tanker truck. 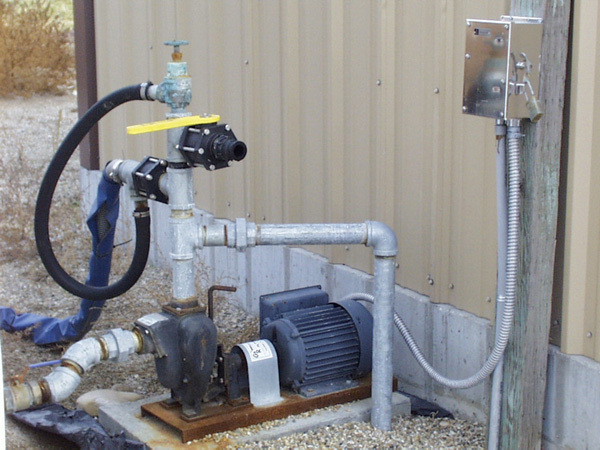 Pump for transferring liquid chemical to application trucks. 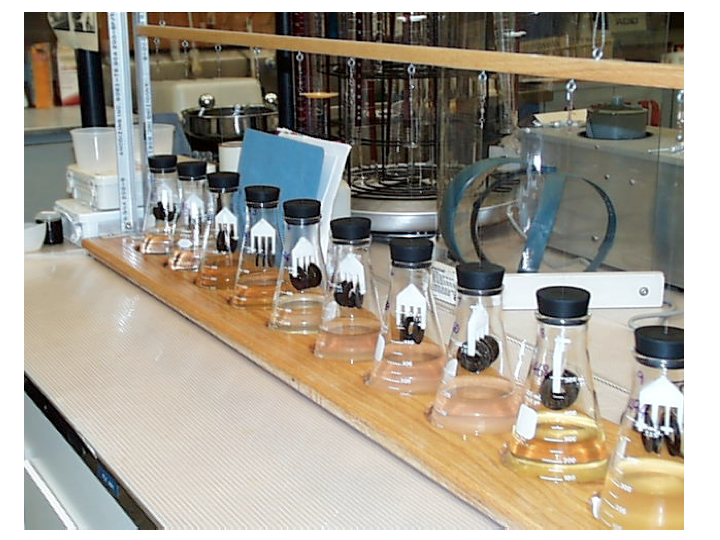 Sample port for taking a sample during delivery. 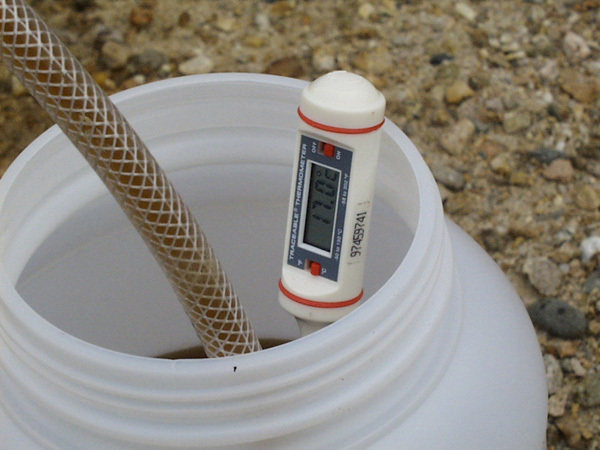 Checking the temperature of the solution. 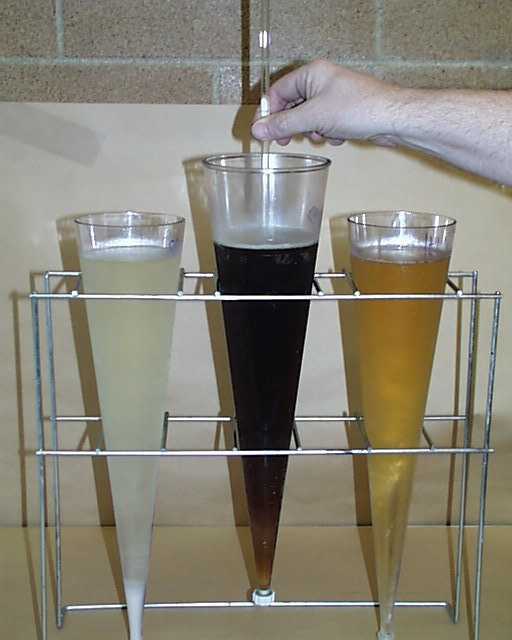 Hydrometer and Graduated Cylinder used to determine the density of the product during delivery. 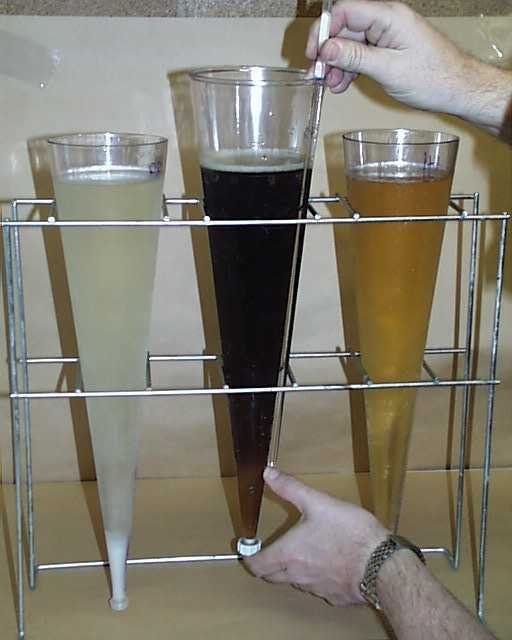 Using the hydrometer to measure the material density. 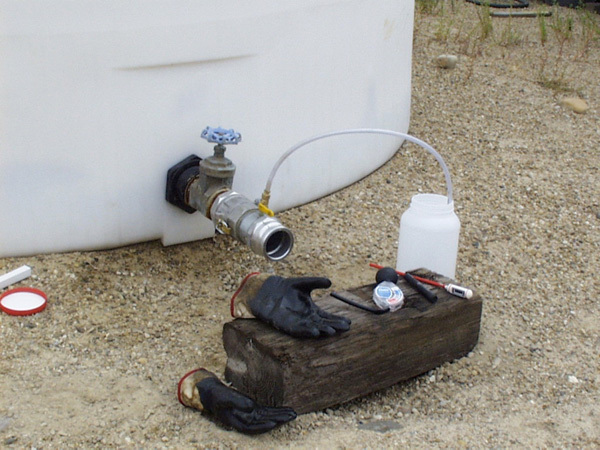 Corrosion Instrument with prepared test solution that determines the Percent Corrosion Effectivness of deicers by dipping coupons in and out for three days. Closeup of a steel coupon that is just starting to corrode. 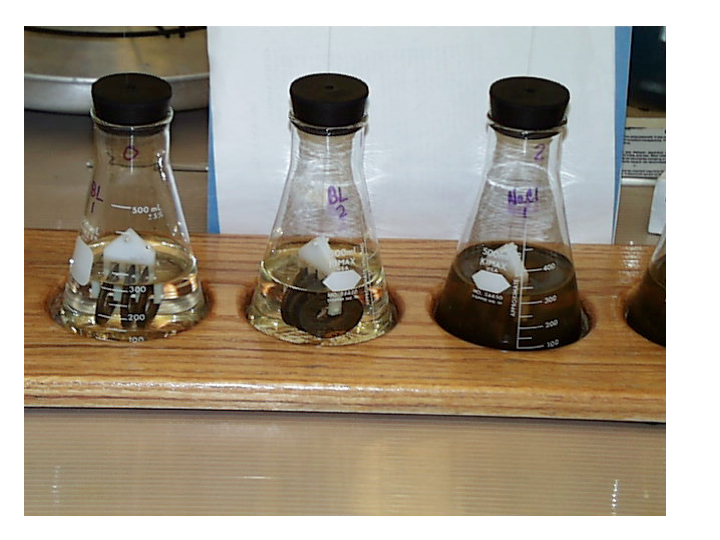 Appearance of coupons and solutions of Distilled Water (left) and a 3% Salt solution (right). 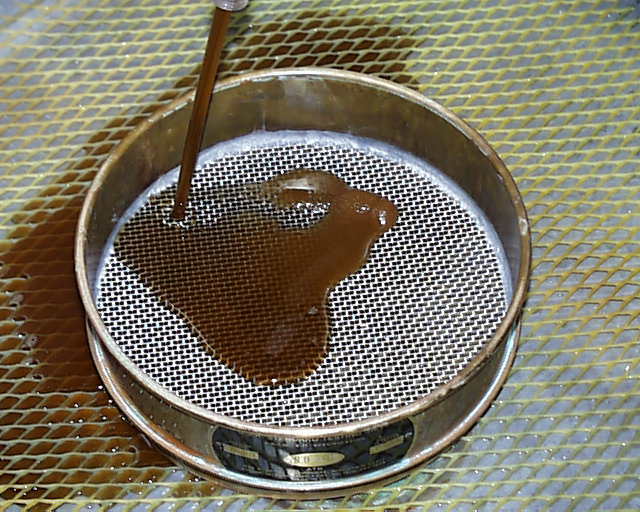 Closeup of coupon showing corrosion and solution showing darkening color. 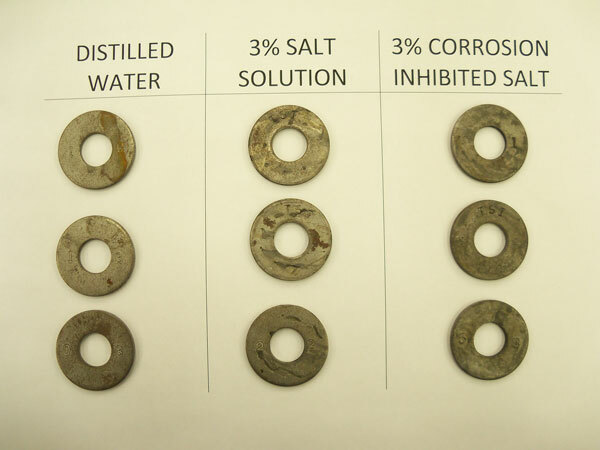 Coupons after testing showing corrosion. 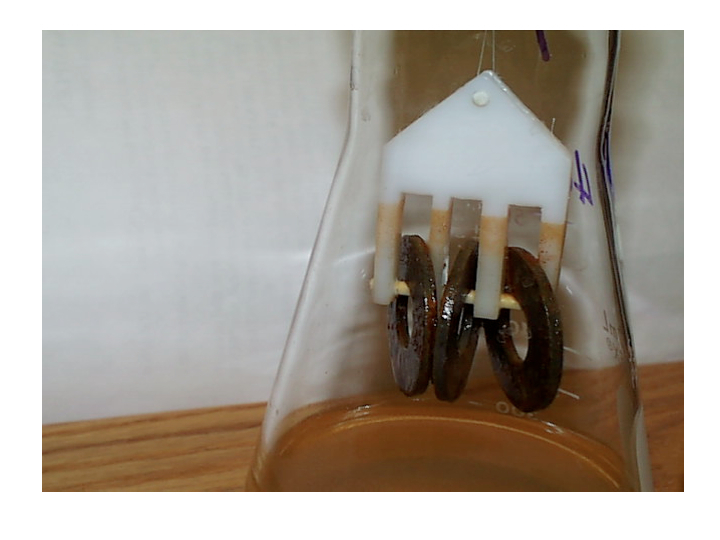 Notice the amount of corrosion between distilled water, salt, and an inhibited product. 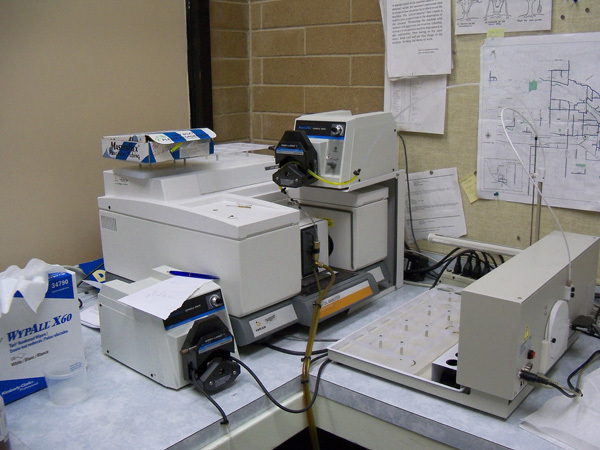 X-Ray Fluorescence Spectrometer used to determine elemental composition of materials. 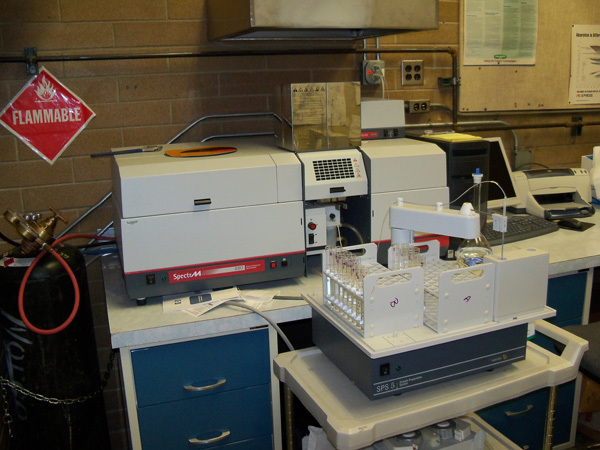 Atomic Absorption Spectrometer used to determine the concentration of liquid salts and trace metals. 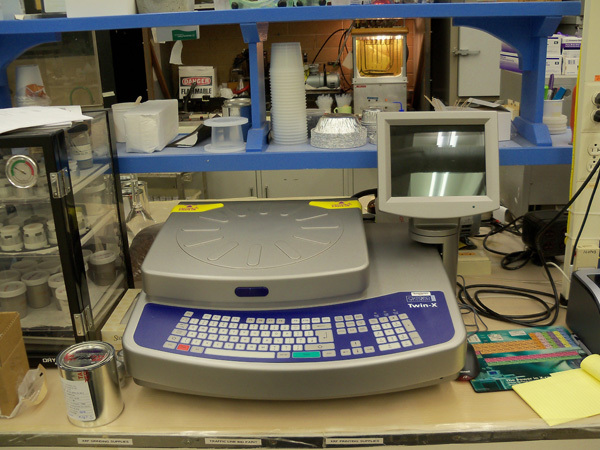 FT- Infrared Spectrometer to determine the organic makeup of chemicals. 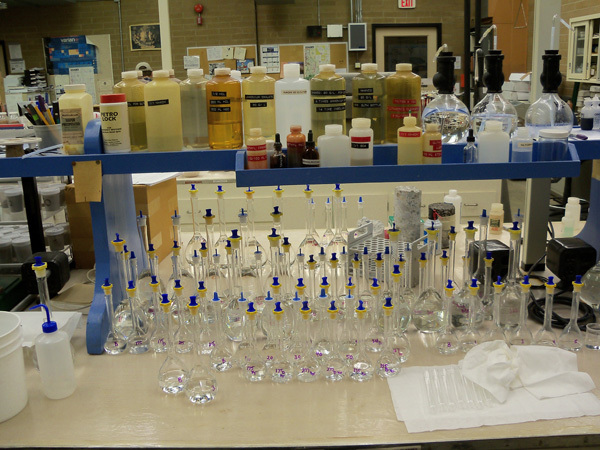 Laboratory glassware and chemicals used for testing materials.